Yesterday, New York State Assembly Minority Leader Brian M. Kolb (R,C,I,Ref-Canandaigua) attended the annual United Way Day of Caring at the Canandaigua VA Medical Center. Through its volunteers, United Way raises money and advocates for the people in the community who need help the most. 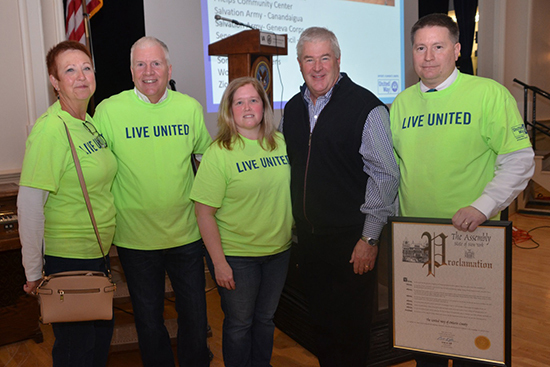 At this event, Leader Kolb (second from right) presented Debbie & Don Culeton, 2018 Campaign Chairs (left), Kari Buch, United Way of Ontario County Executive Director (center) and Matthew Hoose, United Way of Ontario County President (right) with a Proclamation to express his gratitude to United Way for the positive impacts it and its volunteers have on the entire Ontario County community.